Ensu Rai who is a singer and a tourist guide has come up with a documentary ‘Nepal is safe for Tourism Forever’. The documentary spanning three minutes and 11 seconds has shots of ascents to the world’s highest summit Mount Everest and scene of Himalayas. 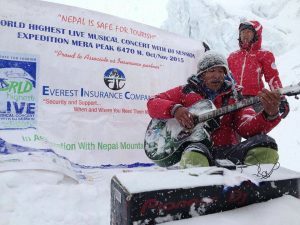 Six months after the devastating earthquake, Rai had also organised a live musical concert at the altitude of 6,471 metres to give a message that Nepal is safe for tourism. The documentary has also depicted the panorama of Pattale Mountain (3,200 metres) located between Solukhumbu and Okhaldhunga. Pattale Mountain has the potential to be a new tourism destination, said singer Rai. The documentary has been edited by Anil Kumar Maharjan and presented by Mountaineering Culture Expedition Nepal.